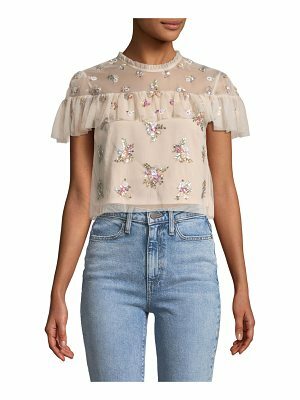 Top by Starlet, Embellished woven fabric, High neck, Long sleeves, Cropped length, Slim fit - cut close to the body, Machine wash, 100% Polyester, Our model wears a UK 8/EU 36/US 4. With its standout bodycons and sequinned dresses, Starlet proves first impressions count. Shop its embroidered and hand-embellished pieces, designed by its talented team and inspired by the catwalks, for a night to remember.